Works with the Autofeed feature. It specifies the minimum allowable feedrate override percentage that the Autofeed feature can use and should initially be set to 1. NOTE: In Lathes, last commanded feedrate is restored at the end of the program execution, or when the operator presses Reset or turns off Autofeed. 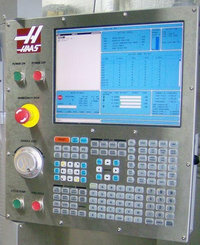 NOTE: In Lathes, the operator may use the feedrate override buttons while the Autofeed feature is active. As long as tool load limit is not exceeded, these buttons will have the expected effect and the overridden feedrate will be recognized as the new commanded feedrate by the Autofeed feature. However, if the tool load limit has already been exceeded, the control will ignore the feedrate override buttons and the commanded feedrate will remain unchanged.